Sodium bicarbonate (also known as baking soda or bicarbonate of soda) is an alkaline chemical that gives off carbon dioxide when mixed with an acid to cause products to rise during baking. It’s the main ingredient in baking soda and baking powder. What are the ingredients in Baking Powder? Most commercially available baking powders are made up of sodium bicarbonate, one or more acid ingredients (e.g. monocalcium phosphate) and a drying agent, usually cornstarch. When you add baking powder to a wet cake batter, the acid ingredients in the baking powder, react with the sodium bicarbonate to give off carbon dioxide and this causes the cake to rise. On the other hand, baking soda is only made of sodium bicarbonate which is alkaline. It does not contain any acid ingredients. In order for baking soda to cause the product you’re baking to rise, you must use acidic ingredients like lemon, yoghurt, buttermilk or brown sugar (molasses in brown sugar is acidic) to cause it to produce carbon dioxide. Which raising (leavening) agent should I use? Some recipes call for baking soda, while others call for baking powder. What raising agent is used depends on the other ingredients in the recipe. Recipes with baking powder usually call for milk to neutralize the process. 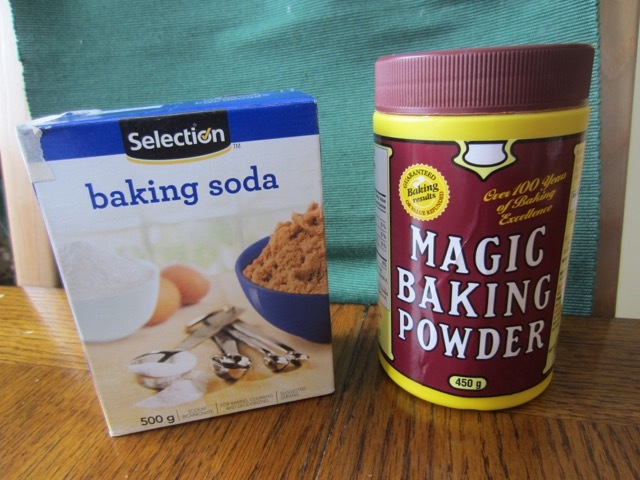 Recipes with baking soda usually call for brown sugar which is acidic, or lemon or yoghurt.. It is important to use the type of raising agent specified in a recipe because it may affect the recipe’s balance of acid. For those of us who are baking-challenged, this post is invaluable, Liz. Thank you. The secret is always just to follow the recipe, step by step, especially for baking! This is such an informative post Liz! There now, I learned something new today about baking powder! I did not know!! Thanks for the lesson. Ha ha. I have a category called ingredients and I’m trying to keep on working on it. I’m glad you learnt something. Thanks. Sandy.